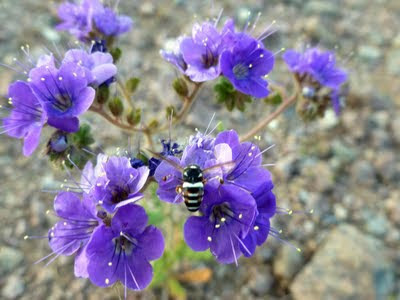 Pollination in action as a bee visits phacelia (lace-leafed?) in the Newberry Mountains Wilderness Area of the Mojave Desert. The Bureau of Land Management (BLM) released a revised biological assessment for BrightSource Energy's Ivanpah Solar Energy Generating System, indicating the likely presence of a high density of endangered desert tortoises on the 5.6 square mile swath of public land. The revised assessment is required because BLM and the US Fish and Wildlife Service determined that the number of tortoises impacted by the project would far exceed the 38 expected to be killed or displaced by construction and operation. The assessment provides detailed estimates of the number of tortoises that might be killed, harassed (marked, handled, etc), translocated (moved a distance away from where it was found), or held in quarantine. BrightSource Energy's Plans in Trouble--Buyer's Remorse? BrightSource Energy is offering to reduce its Ivanpah Solar Energy Generating System project by 12% in response to concerns about its environmental impacts, but will that be enough? The company already exceeded the "take" limit established by the US Fish and Wildlife Service since it has displaced at least 49 endangered desert tortoises, as of February. The project was only approved to displace 36. According to High Country News, a second tortoise died on the site from heat distress as it attempted to return to its now-destroyed burrow in a bulldozed area of the project. In 1913, John Muir found himself confronting formidable forces that sought to entomb a pristine valley he had long fought to protect. 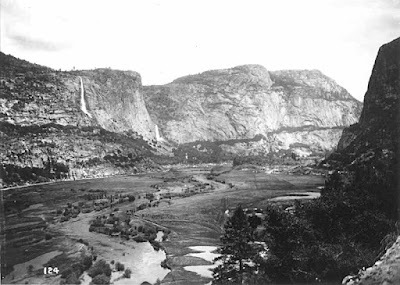 Congress, the White House, and San Francisco's water utility were eager to fill the beautiful Hetch Hetchy Valley near Yosemite with water that would supply a growing metropolis far away on California's coast. Muir was an amicable, reasonable and open-minded naturalist, as portrayed in A Passion for Nature: The Life of John Muir by Donald Worster. He did not fight projects for the sake of obstruction, but for sensible policy. There were other sources of water closer to San Fransisco, he argued, and it was needlessly accepted that the city's growth and thirst should not be tamed or made more efficient. The Department of Interior ordered BrightSource Energy LLC to temporarily halt construction on phases 2 and 3 of the Ivanpah Solar Energy Generating System since the project's impacts on the endangered desert tortoise have exceeded initial estimates. The 5.6 square mile project is being built on public land and was approved by the Department of Interior and California Energy Commission in October after a hasty environmental review process. Washington and Sacramento were intent on approving the project in time for BrightSource to qualify for taxpayer-backed financing. BrightSource Energy LLC's plans to bulldoze 5.6 square miles of pristine desert habitat on public land is expected to displace or kill 140 desert tortoises. 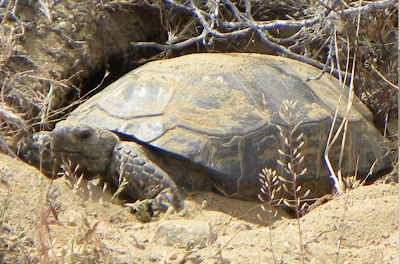 The number of tortoises thriving on this land is a testament to the habitat quality and biodiversity on the site, but the environmental costs were ignored by the Department of Interior, headed by Secretary Ken Salazar, during a faulty approval process for the BrightSource's Ivanpah Solar Energy Generating System. 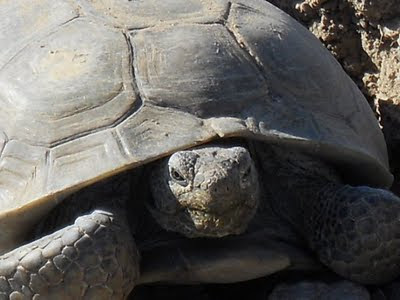 Sign the petition now to tell Secretary Salazar to hault construction at Ivanpah and keep solar panels on rooftops, and off of tortoise habitat! Thousand of rooftops in our cities bake under the California sun, and hundreds of thousands of acres of already-disturbed land identified by EPA's RE-powering America's Land program sit idle -- perfect places for solar panels. BrightSource Energy LLC, which portrays itself as an innovative solar energy company, ignored these options and decided to begin bulldozing 5.6 square miles of pristine desert habitat on public land (using 1.4 billion dollars of taxpayer-backed financing). A video recently released on You Tube (below) of crews clearing old growth desert for BrightSource's Ivanpah Solar Energy Generating System in the northeastern Mojave Desert reveals a different kind of company. This is a business that is not worthy of the "green" reputation bestowed upon it by those who only believe in protecting nature when she is not standing in the way of profit. A coalition of energy experts, biologists and concerned citizens known as Solar Done Rightissued a report Monday questioning why Washington wants to sacrifice hundreds of square miles of public land and billions of taxpayer dollars to solar energy companies instead of encouraging rooftop solar. The report is available on Solar Done Right's website. Solar Done Right's report is a response to the policy proposals contained in the Draft Solar Programmatic Environmental Impact Statement (Draft PEIS). The Draft PEIS was issued jointly by the Departments of Interior and Energy last year, and seeks to establish a policy of offering over 22 million acres of mostly pristine desert habitat for development to solar energy companies. The Draft PEIS fails to consider alternatives to sacrificing public land, such as implementing policies that encourage distributed generation (aka rooftop solar). This blog previously commented on the inadequacies of the Draft PEIS. The massive solar power projects that threaten to destroy public land throughout America's southwestern deserts are coated in economic promise. The Obama administration included loan guarantees and grants as part of the American Reinvestment and Recovery Act in order boost renewable energy generation, and Congress extended the Treasury Grant Program that funnels taxpayers' money to renewable energy companies. In order to justify this money, the projects are promoted by politicians as "green" job creation engines, but the impact of these jobs is inflated and misleading. Basin and Range Watch posted new photos of the construction of BrightSource Energy's Ivanpah Solar Energy Generating System in the northeastern Mojave Desert. Taxpayers' money is being used to provide 1.4 billion dollars in financing to the project, and American citizens are giving up over 5 square miles of public land to the company. 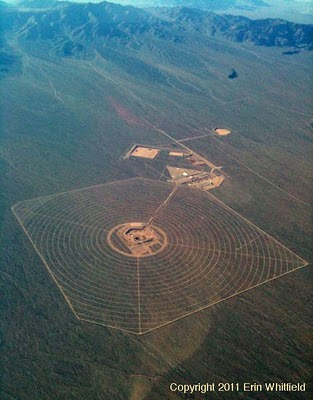 According to the draft Programmatic Environmental Impact Statement, the Department of Interior expects the solar energy industry to bulldoze over 300 square miles of desert habitat -- multiply the destruction in the photos below by 150 if you want to imagine what our energy policy will do to our public land.